Believe it or not, I have been collecting and writing my Top 50 Things to Do in Austin list for over six years! And ziplining has been on that list for every one of those six years. However, my youngest son just turned 10 in August, and reached 70 pounds shortly thereafter (both requirements for ziplining). 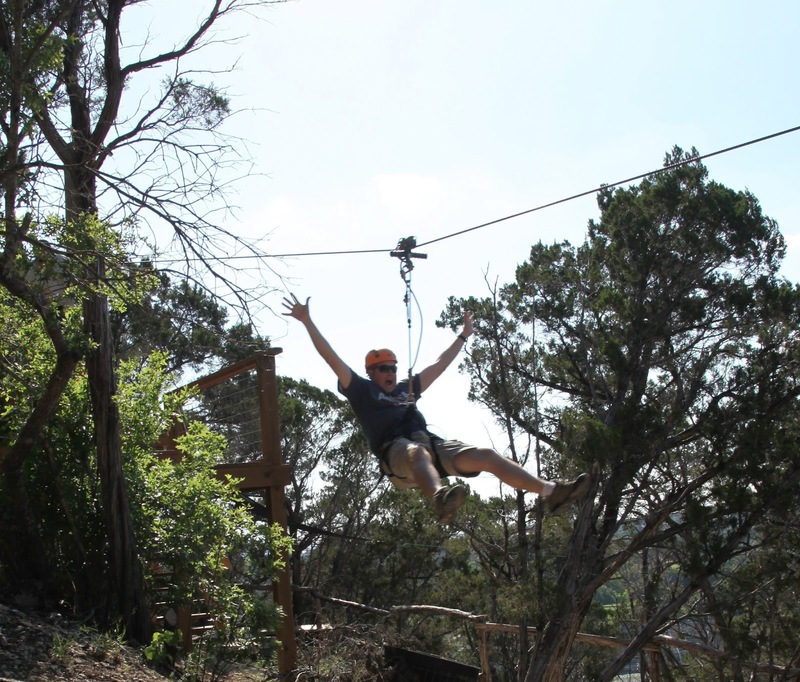 So, for Mother's Day, Dave and the boys treated me to the Lake Travis Zipline tour. And it was AWESOME!! Lake Travis ZipLine Adventures is located in Volente Texas, by the lake. It is an extremely well-run and safe operation and I would highly recommend it. They have only been in operation since July 2011, but they have clearly worked out all of the kinks as our tour was extremely smooth! We arrived early, so we headed down to the water to wait. The boys spent the time doing one of their favorite activities... throwing rocks in the water! Then, we all got in a van, and they trucked us over to the marina. Apparently Lake Travis Zipline neighbors would prefer that the operation not launch the boat every half hour from the on-site dock, so right now they are launching out of a nearby marina. The boat ride to the main zipline area was short, but enjoyable. Once there, we were assigned two guides: JD and Yeti. In addition to getting us harnassed and keeping us safe and secure the entire four hours, they also kept us laughing and entertained. Not that any additional entertainment was really necessary! The rides were exhilarating! The course has 5 ziplines. The first two are "babies", to work out kinks, and get everyone ready for the three big ones. * I think the stated length of the tour is three hours. We went on their busiest weekend - so all the tours were full -- which makes everything go a bit slower. Our tour started at 4:30pm, and we returned to the main camp around 8:10pm. So, on some days it can take a little longer. * The course requires about a mile of hiking, most of it uphill. My ten year managed it just fine, but the last hike is equivalent to 12 flights of stairs. Just be prepared. * They allow you to bring coolers and enjoy the lake either before or after your tour. * They also offer night-time tours, for a different perspective. I think they might be more exciting, but less scenic. And they mentioned on Halloween they do a 'special' tour which also sounds like a lot of fun! 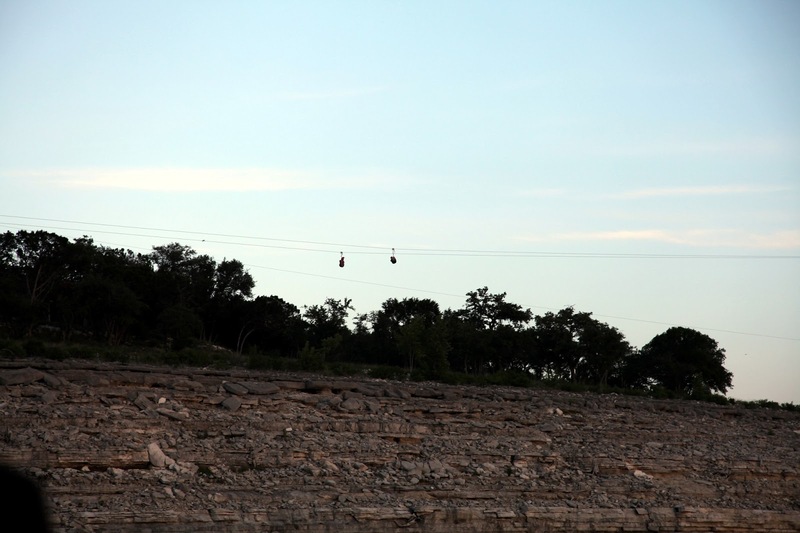 * The turn off from 2769 onto Pocohontas does not have any Lake Travis Zipline signage. We were enjoying the scenery and car ride, and managed to zip ("Ha - get it?") right past it the first time, then had to loop around and come back. * Bring cash as the guides accept tips. And they work pretty hard!